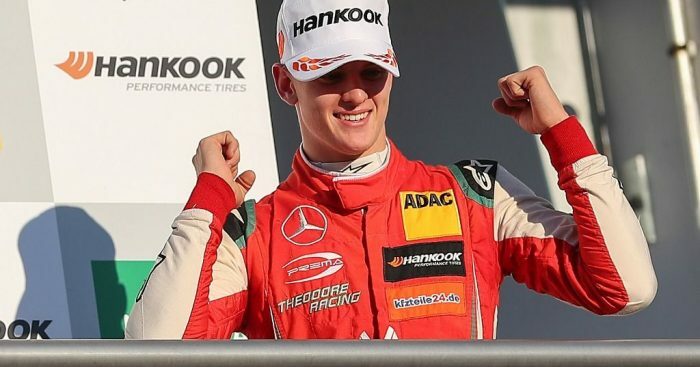 Mick Schumacher won’t get into Formula 1 on the Schumacher name alone, he needs to get the results out on track. That’s according to another racing son, Carlos Sainz Jr.
Schumacher, the son of seven-time World Champion and Ferrari legend Michael Schumacher, is knocking on the door of Formula 1 after his European Formula 3 title success. The 19-year-old came from behind to put in a strong second half of the season, taking eight race wins with Prema Theodore Racing. His championship success means he has enough points to earn a F1 superlicence, however, he is expected to continue up the ranks with a Formula 2 drive next season. But while the likes of Lewis Hamilton reckon it may be only a matter of time before there’s a new Schumacher in F1, Sainz Jr has warned the name won’t do it alone. “At the beginning, the pressure is enormous,” Sainz Jr told GPFans.net. “All the parents would have told their children in karting that to crush Mick Schumacher would be great. Sainz Jr is the son of rally legend Carlos Sainz, one of three drivers on this year’s grid with racing fathers. The other two are Max Verstappen and Kevin Magnussen.